OXFORD, Miss. – It’s the New Year, a time when many people rethink their diet. But for doctoral students in the University of Mississippi’s Department of Nutrition and Hospitality Management, rethinking diets is a year-round activity. “A proper diet is important for everyone, but it is critical for athletes,” said Melinda Valliant, associate professor of nutrition and hospitality management and co-director of the university’s Center for Health and Sport Performance. Faculty, staff and graduate students from the sport nutrition emphasis provide dietetics services to athletes across 16 different Ole Miss sports through the center. Prescribing individual meal plans based on an athlete’s physical output is just part of what the students, faculty and staff offer for athletes looking to retool their fuel. “Sports dietetics is both food service and clinical work,” Valliant said. “They are prescribing meal plans, providing education, doing grocery store tours and hosting cooking classes. Matthew Frakes, is a registered dietitian enrolled in the Ph.D program, is working to meet the requisite hours he needs to obtain credentials as a certified specialist in sports dietetics. He works with athletes in baseball, track and field and golf. “My favorite part of what I do is working with athletes and seeing the outcomes they want to see after helping them with the missing nutrition pieces to their performance puzzle,” Frakes said. “For instance, an athlete who complained of feeling tired and sluggish throughout the day was having trouble with putting on weight for their individual goal. Frakes stays busy, conducting group nutrition education talks; developing individual nutrition assessments; creating nutrition education material; preparing practice, training and competition refueling snacks and travel bags; executing BodPod body composition assessments and working with the coaching staff on individual and team health and performance goals. His passion for sports nutrition began as an undergraduate student-athlete, playing football for Ohio University, then Bowling Green State University and studying nutrition. Frakes is enrolled alongside Corbit Franks, an assistant athletic trainer who decided to enter the doctoral program when he started seeing the distinct advantages and disadvantages that food choices create in athletic competition. “Dr. Valliant has been a phenomenal mentor,” Frakes said. “She challenges us to think outside the box and allows many opportunities to learn. The education and my experience working with her on a daily basis will provide opportunities to expand myself as an educator and professional. 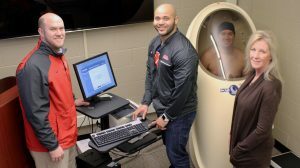 While Ole Miss athletes get world-class nutrition counseling, the department has a pool of athletes for case study to develop injury protocol and add to a growing body of peer-reviewed sports nutrition research. Similar programs at other universities allow students to work only with intramural athletes, but the unique relationship with athletics affords UM doctoral students full access to all athletes in their cafeteria, weight rooms and training rooms. The job market for sports dieticians has increased dramatically in recent years, Valliant said. She has seen a shift in perception of sports nutrition on campus. “Attitudes in the athletics department around nutrition have certainly changed,” she said. “I think people see the value in sport nutrition – that dietitians are valuable team members. I also think having this program has allowed us to have more numbers. Teresa Carithers, School of Applied Sciences interim dean, sees potential for the center to draw national attention as its improves clinical outcomes and contributes critical research. Approved by the IHL in October 2013, the center began as a partnership between the departments of Nutrition and Hospitality Management and Intercollegiate Athletics, and continues to grow its staff and student support. Shannon Singletary, senior associate athletics director for health and sports performance, co-directs the center, and Kate Callaway, a certified specialist in sports dietetics, joined the staff in 2016. For more information about the sports nutrition emphasis in the Nutrition and Hospitality Management Ph.D. program, contact Valliant at valliant@olemiss.edu or visit http://nhm.olemiss.edu/.